As with My Blueberry Nights and 2046, a person trying to escape their own past romantic disappointments becomes witness to the stories of other people, and thus is able to cope with their own issues. Like Chow Mo-wan in In the Mood for Love, Ouyang Feng (Leslie Cheung) has lost the love of his life, Maggie Cheung in both cases, because he failed to take action. She marries his brother and he sets himself up in a remote desert outpost where he acts as a middleman for people looking to hire swordsmen. The first story stars Brigitte Lin as a person with a split personality. The heir to the Murong clan, named either Murong Yin or Murong Yang depending on if the female or male personality is dominant, respectively. Yang is in love with Yin and wants Ouyang to kill the man Yin loves. Yin in turn wants Ouyang to kill Yang. 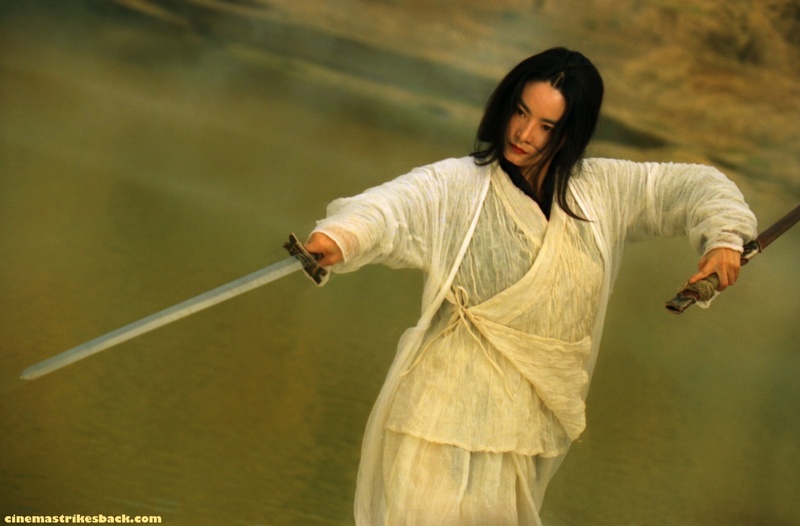 The story plays off Lin’s androgynous star persona, memorable from Ching Siu-tung’s Swordsman II, in which her gaining advanced kung fu powers turns her from a man into a woman, while also establishing that the romantic problems of Wong’s heroes are entirely self-contained. His lovers are not separated by circumstance or society or the crossing of stars, though they might describe it as fate, their problems are really of their own creation. It also establishes that the kind of obsessive romanticism his characters express is also solipsistic, it’s more about creating an image of their self than it is about connecting with another human being. Wong’s selfish characters find such connection impossible, all they can do is strike a dashing pose. Their lives are mediated through their romantically tragic ideals, or through the adoption of certain genre-based identities (see: As Tears Go By, Days of Being Wild, Chungking Express, Fallen Angels) the paradox is that that mediation, through the hearing and telling of stories, is the way his characters ultimately find some measure of solace or even, rarely (Chungking Express, My Blueberry Nights) a measure of happiness. (This is why Faye and Cop 663 in Chungking Express are Wong’s most remarkable heroes: they are the only ones able to transform the very nature of reality itself, and thus their story becomes romantic comedy rather than tragedy). The second story follows Tony Leung Chiu-wai’s swordsman, nearly 30 years old and almost blind (growing up is a kind of death, of course). Sad that his wife has left him for his best friend, he wants to go home and see the peach blossoms one last time. The best friend is played by Tony Leung Ka-fai (again the self-focus: the Tony Leungs divided against themselves), who we had met somewhat earlier. TLKF, playing Huang Yaoshi, threads his way through all the stories as a kind of counter to Ouyang Feng. Huang is an annual visitor to Ouyang’s outpost, and this time he’s brought a bottle of magic wine that erases your memory (see also: 2046). Huang drinks the wine and promptly forgets that he’s the desire object not just of TLCW’s wife, but also the first story’s Murong Yin. But more on that in a bit. The blind swordsman hires himself out to the villagers, before leaving, he grabs a young girl (she’s waiting by the outpost to hire a swordsman, but can only pay with a handful of eggs), sweeps her into his arms and kisses her. “I don’t know why I did that” he says in voiceover, as we see her annoyed reaction at being used as a prop in his romantic hero pose. 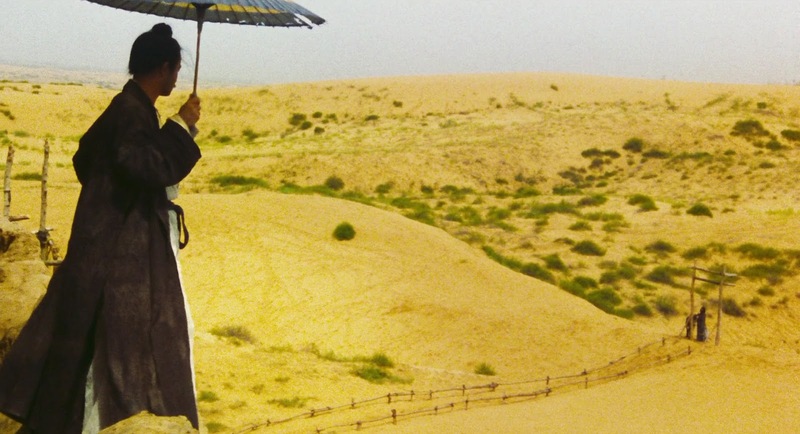 As he marches off to face the enemy, his story provides the ideal opportunity for Wong and cinematographer Christopher Doyle to indulge themselves with some of the wildest images of their legendary partnership. Ashes of Time, at least in the Redux version that is the only one currently available (I saw the old crappy DVD of the original cut years ago, but really don’t remember it all that well) is a remarkably beautiful film. 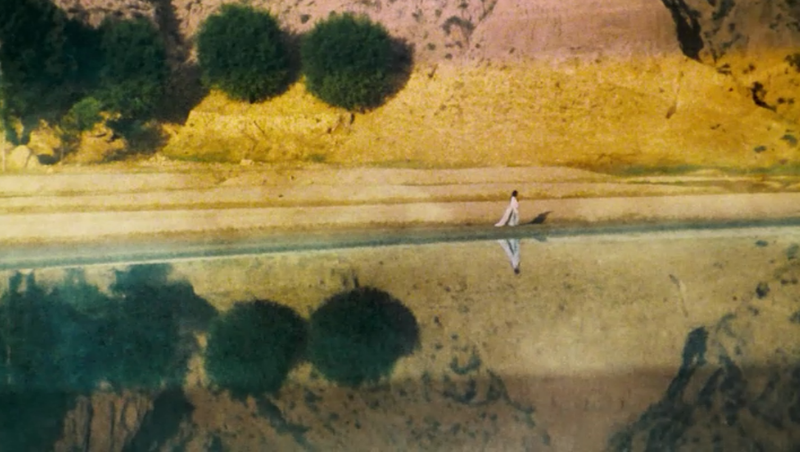 Now, to some extent these things are subjective: one person’s gorgeous is another person’s indulgent (see also: the wuixa epics of Zhang Yimou), but I’ve never seen anything like this film’s hallucinogenic desert landscapes, overexposed colors threatening to burn themselves right out of the frame, step-printed slow-motion reducing Sammo Hung’s fight choreography to swirls of dirt and blood and death. Look carefully and you’ll see this is some of Sammo’s best work: the fluidity of his choreography is fully expressed in the blurs of Wong’s imagery. It’s exactly the opposite approach of Sammo’s own visual style, and that of the Shaw Brothers masters before him, with their emphasis on clarity and precision of movement. Nor is it like the montage-heavy wire-fu style of Ching Siu-tung, which uses editing to connect formal poses with impossible movements in an onslaught of high-speed action. Wong’s fights don’t just convey the visceral, emotional chaos of combat, as in the even more extreme montage approach of Paul Greengrass (to take one example out of many in contemporary Hollywood). The blur itself is a thing of beauty, with Sammo’s team’s highly skilled and organized movements still visible within the impressionistic images. In this way, it combines the emphasis on displaying real-life stunt man skill of the old Shaw style with a more expressive visual approach. Rather than hide the kung fu choreography behind a swirl of editing and cinematography, Ashes of Timerenders it more radically beautiful than had ever been done before. The third and fourth stories are mirror-images. 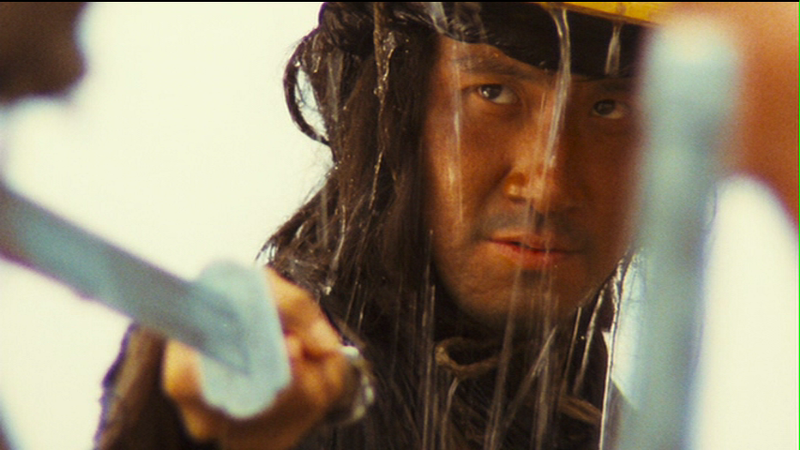 Jacky Cheung, playing Hong Qigong, arrives at the outpost as a shoeless swordsman and defeats the bandits, but loses a finger. His wife shows up and Ouyang persuades him to take her with him on his various quests, they had been estranged as he journeyed away from the home. Hong also helps the egg-girl. We then learn about Ouyang’s backstory through voiceover by Maggie Cheung as she tells it to Huang Yaoshi, the other Tony Leung. Ouyang left her behind, never telling her he loved her, so out of spite she married his brother and now they’re all miserable, Maggie living on Peach Blossom Island, with Huang visiting her every year the same way he visits Ouyang at his outpost on the opposite end of the country. 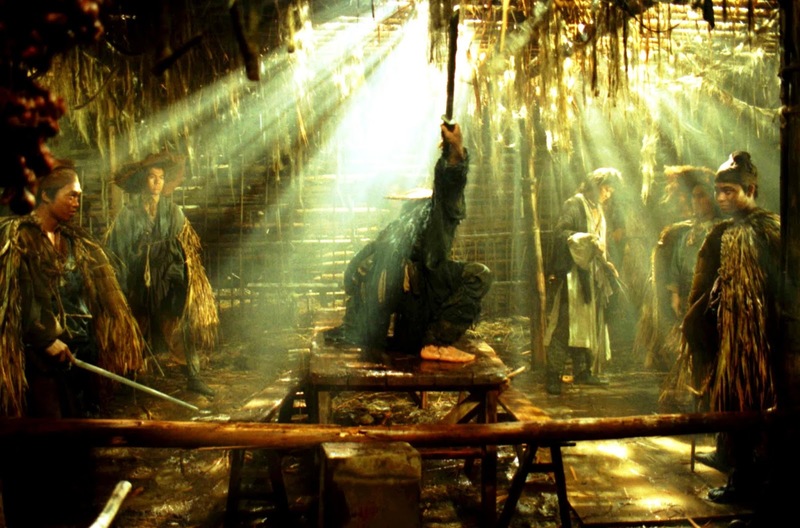 The Blind Swordsman, too, was sad because his wife (Carina Lau, her character named “Peach Blossom”) was in love with the other Tony Leung, his “brother”. Hong is able to resolve the conflict between love and jianghu by bringing his wife along on his travels, something Ouyang and the Blind Swordsman failed to do, with the result that they lost their lovers to other men while Hong keeps his. The only other way to resolve the romantic sadness that torments the characters is the magic memory-erasing wine, given by Maggie to Huang in the hopes that he’ll give it to Ouyang. Huang drinks it himself first, erasing his memory of Peach Blossom, of Murong Yin/Yang, and of Maggie, the women he’s loved, been loved by and from whom he’s heard a tragic love story, respectively. He then retreats to the East while Ouyang reenters the world. 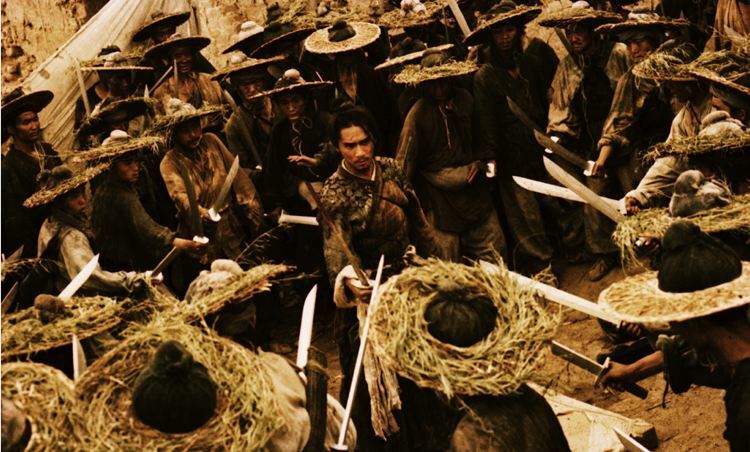 Their stories continue from there in Louis Cha’s books as the Lords of the East and West, respectively (while Hong Qigong becomes the Nine-Fingered Swordsman, the King of Beggars). So Ashes of Time presents a few recurring Wongian themes: loss of love, the torments of memory, paralysis in the face of desire, but places them firmly in a wuxia generic context. But it doesn’t really explore these martial codes as the source of personal or romantic unhappiness, in the way that, say Chang Cheh or Johnnie To examine the contradictions inherent in the martial codes that lie at the heart of martial fiction (whether supernatural wuxia, realist kung fu or modern triad/cop stories). Wong seems simply unable to make a straight genre film, it always digresses, mutates, twists into a purely Wong Kar-wai movie in the “final” editing (which is always temporary, with Wong not even final cuts are permanent). This is what makes The Odd One Dies is To’s most Wongian film: it wants desperately to be the assassin/triad film the plot and setting demands, but a lushly tragic romance bursts forth instead. For Wong, the sources of anguish are as much personal as external. Indeed, the heroes of Ashes of Time, if you can even call them that, don’t follow much in the way of codes of honor anyway, as in the repeated betrayals of one’s own brother (in the stories of the Blind Swordsman and Ouyang Feng, and sort of in the story of Murong Yin/Yang). The only hero who manages a level of romantic happiness is Hong Qigong, who violates the martial code by bringing his wife along on his journeys, resolving the demanded split between the martial and the marital, actively choosing to behave as a unified whole with his wife. Action is always painfully difficult for Wong’s heroes. Andy Lau in As Tears Go By is unable to pursue Maggie Cheung because of his loyalty to his “brother”, Jacky Cheung and the triad code he follows. 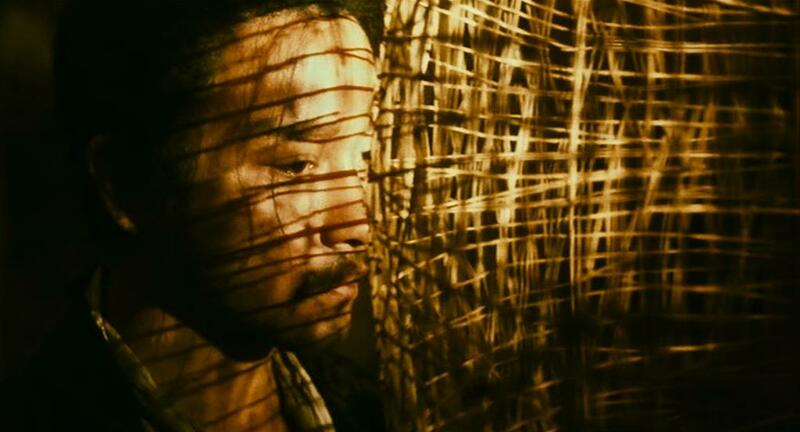 Tony Leung in In the Mood for Love is unable to pursue Maggie Cheung because of his loyalty to his wife and the marriage code he follows, despite the fact that his wife has betrayed him. Wong seems more interested in how we cope after love has gone wrong than in how it went wrong in the first place. In Chungking Express, the two cops slowly move on from failed relationships after magical encounters with other women. In 2046, Tony Leung turns the events and characters of all of the previous Wong Kar-wai movies into characters in a novel, set far in the future, where time and memory stand still. In My Blueberry Nights, Norah Jones travels across America, watching other people’s disappointments and gathering the strength to move on from her own. And in Ashes of Time, the failed lovers obliterate themselves, while Ouyang Feng listens to their stories, tells them to us, and moves on.